"Tourists don’t know where they’ve been, travelers don’t know where they’re going." 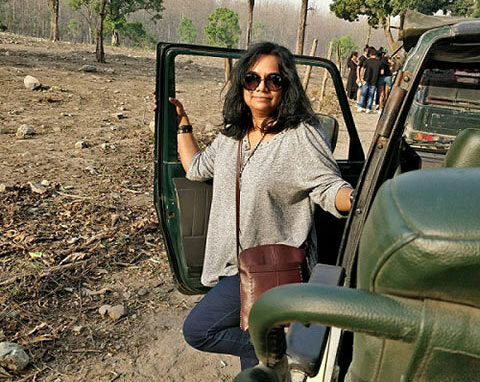 Sudha Pillai has over two decades of experience in media - as Creative Director, Editor and Head of Features/News Features of various national newspapers, magazines, television and animation production houses. Her responsibilities at these organizations included launching print, digital and television properties, reinventing existing lifestyle and feature sections, leading large groups of creative people, as well as sourcing, management, innovation and production. After more than two decades of working in mainstream media, Sudha charted her own course. Currently, she works as a freelance travel writer and columnist and is Head of Outreach Projects for Meaww (Music, entertainment and arts worldwide) - a global media company. AIRDA’s content team talks to Sudha about her personal journey in the world of mainstream media, and her detours as a gypsy soul. In these conversations, She talks to us about her feelings of wanderlust and constant search for something new. 01. What’s really behind “getting to know Sudha Pillai’s Gypsy Soul”? What gets you packing your bags and heading off somewhere? It is the need for constant change and adventure that fuels my gypsy soul. Adventure need not necessarily mean climbing Mt.Everest; it also means the adventure of meeting new people, encountering new cultures, traditions, and anything that is not my norm. The idea of experiencing something new is what makes me pack my bags. And also the fact that each journey changes me a bit as a person. Travel makes you learn and unlearn things in life. Witnessing this change in me is also exciting. And the third factor that motivates me to pack my bags is that I think I travel because I am searching for something. It’s just that I am yet to discover what I am searching for. I am not unduly worried since I believe I will know when I finally find what I am searching for and that will be the end of this fantastic journey in life and the beginning of the next. 02. What travel formats have you explored over the years – travel based on health & rejuvenation, historical locations, religious sites, wildlife sanctuaries, purely tourist locations – what draws you into that travel mode? I think though I have explored all formats that you have mentioned, there’s so much more left to explore. My travels are not meticulously planned. I don’t consciously embark on a journey based on a format. It is more of what catches my attention or fires my imagination at that moment. My explorations of wildlife sanctuaries are kind of limited, though nature is an essential motif in my journeys and my life. The reason being, I refuse to go on safaris sitting on a jumbo (elephants are meant to live in the forest, not carry humans or work for humans or prance around in temples) and the next option, jeep safaris, is again something that I battle with, since I believe putting a motorized vehicle in a forest is like having someone intrude upon your privacy at your home. I prefer to trek through the forests, but there are limitations to that. I am yet to find a happy, guilt-free medium to explore wildlife – hoping to do so soon. However, elephants are ruled out. 03. From your travel writing, it seems like you’ve travelled the seven seas, and more? How do you manage to do this? Is this work? Or does it take you away from work? You need more than one life, in fact many lives, to travel to your heart’s content. According to me, I haven’t travelled even two per cent of what I want to. I guess, I just give people the illusion of being well-travelled. I have been working a demanding career for the last 24 years. When you are a journalist/editor in a mainstream newspaper you are on the job 24/7. My job left me very little time to travel. It was with great difficulty that I’d carve out time for travel. In 2016, I quit my job and travelled for a year. During which time, I also made the crucial decision of not getting back to mainstream media again. I wanted to do things for myself and at my own pace. I wanted to indulge in making art, photography, write and of course travel. And that’s what I did and have been doing since. Travel for me is never work. I travel for the sake of travelling. Writing is incidental. I am a freelance travel writer and photographer. Of course, I do have a regular job as Head of Outreach Projects for a global media company called Meaww. When I met the founders, I told them that I will not stop travelling and only if they agree to it will I take up the job. They are travellers and adventurers themselves. They are also great believers in travel being a game changer and that it adds value to your professional life. So, I travel 10-15 days a month (during which time I am more like a digital nomad) and the rest of the time I am at work in the office, in Koramangala. It is a happy equation. Also, the job helps me fund my travels..
04. Do you travel alone, or do you choose to go with a travel buddy? Is there sometimes a need to travel alone? What’s the difference? I am a solo traveller. I prefer to travel alone. The only time I travel with a group is when I go on familiarisation trips. I have enjoyed that too. Because so far I have only encountered wonderful company. I always tell people, especially women, that they should travel solo at least once in their lifetime. It helps you push through your fears, shed your inhibitions and learn new things about yourself. It gives you a chance to push your personal boundaries. And also the chance to meet a host of strangers – experiences that will enrich your life greatly. 05. Can you recall vacations with the family, as a child? Or in your growing years? Ironically, travelling in my childhood was restricted to going to my grandmother’s house in Kerala every summer. But the train journey from Chennai to Kerala was enough to pique my interest about the towns and cities that we passed by. However, my most memorable holiday was a 25-day trip across South India that we undertook as a family. My parents made me bunk school too. That made it all the more delicious. My father worked abroad for a considerable time, and he was a great spinner of tales. So, I travelled vicariously through him. 06. Young professionals these days find it hard to take time off from work and go on that annual vacation – what tips, or advice would you have for them? It is always difficult to find a huge chunk of time if you are working a full-time job. However, working a full-time job also means that you are entitled to a certain number of paid leaves. Beginning of the year, sit with your leave calendar, look for those long weekends, add a couple of days to it and you can easily take off for a week or more to make a nice trip. I think an annual vacation should be compulsory. Like how you make a budget, you also budget for your vacation. According to me, travel is as essential as roti, kappda or makaan.